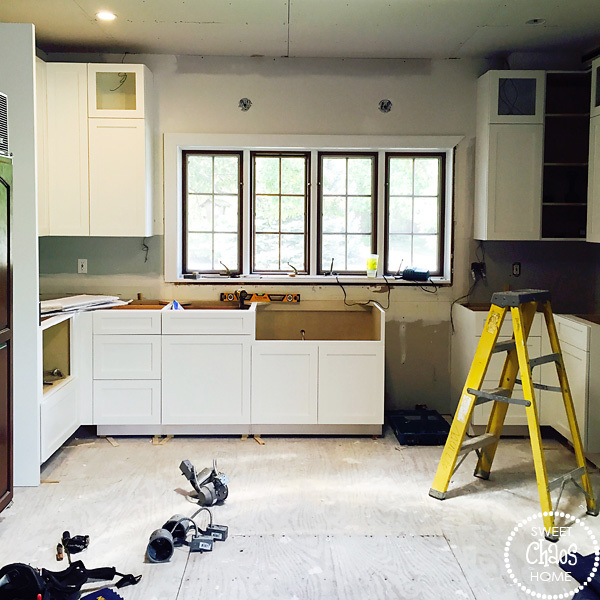 We are in week 3 of our kitchen renovation, and we're finally getting to the fun part. The first couple of weeks consisted of demo (that's a fun part too! 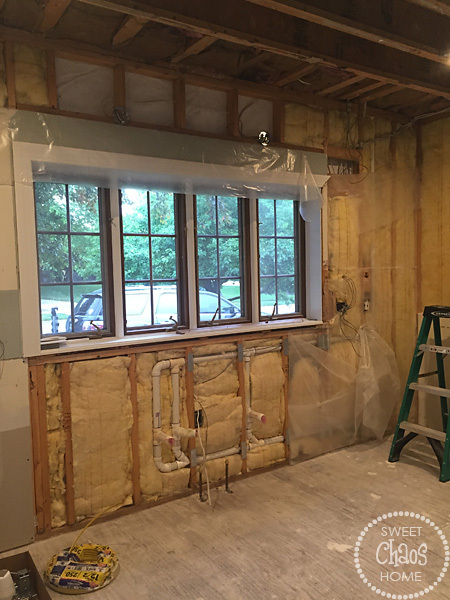 ), and the not-so-glamorous electrical and plumbing work. 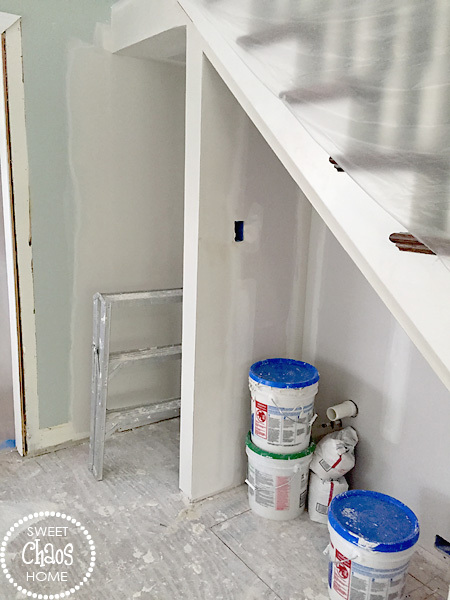 The electrical work involved replacing 8 million can lights with smaller, more strategically-placed recessed lights. They roughed in the electrical for the new sconces and chandelier. A gas line had to be run, as we are switching from an electric to a gas range. Yay! Water lines were moved to accommodate a new sink that will be in the beverage center area. 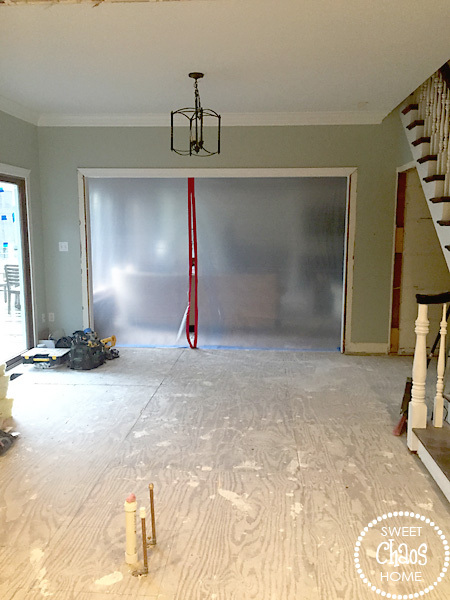 When all of that was complete, new drywall had to be hung. 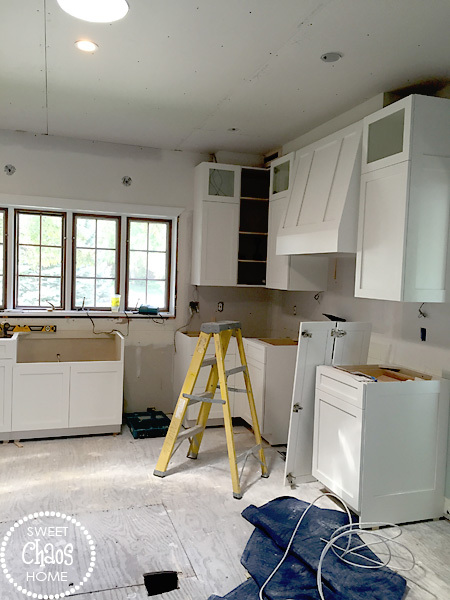 And, finally, the new cabinets could start moving in. So much more still to be done, and my house is an absolute disaster area, but it's coming together. I'm off to make my final countertop selection. Wish me luck! Thanks so much, Nancy! Knock wood… it has actually been better than I thought it would be. Still a long way to go though :) Have a great rest of your week! of renovation as you, dear one!!! I'll be watching for a progress report and updates, soon!!! I am so happy for you. 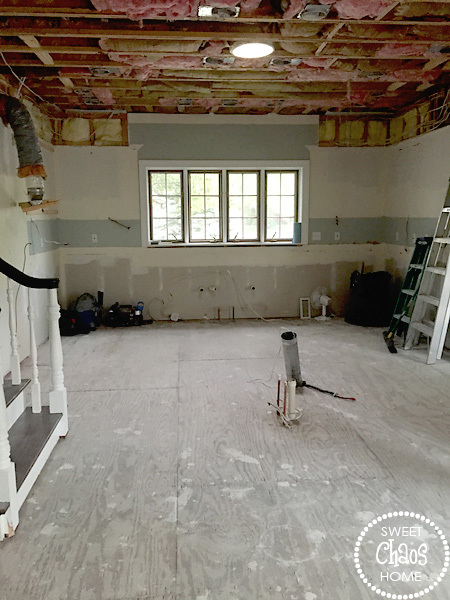 You will REALLY feel as though you have put your stamp on this house with this remodel. It's the most exciting and the hardest area to gut, but you'll be so pleased. I know you did your research and are getting what you want. Hope Paul is willing to do a lot of grilling! Thanks, Linda. I am really excited watching it all come together… finally! It's so much brighter and happier in there. Grateful we finally have some decent weather so we can use the grill!!! How exciting!! It's looking so good! Thanks, Martina! We're getting there… :) Hope you are having a wonderful summer! Hi! I came across your blog online while doing a google search for a perfect round, white mirror and I saw this picture you had in a post a while back! It was in your dining room I believe. Would you mind sharing where you got that from (if you remember? ;) Love the blog! Your home is gorgeous! Thank you so much, Tiffany! Glad you found me :) The large round mirror in my dining room is actually a capiz shell mirror that I found at Home Goods. I love watching your progress. 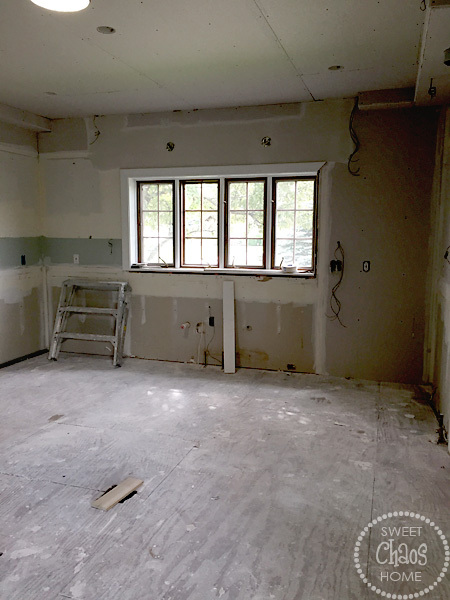 The space is already transforming and is so exciting to see the changes. Hope you aren't getting too stressed out. 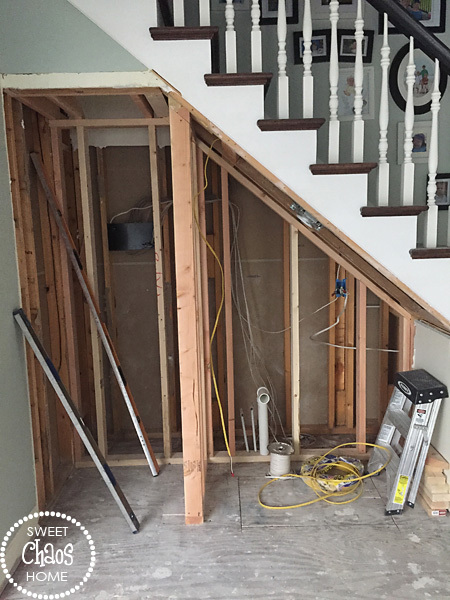 It can get frustrating at times...believe me, I was losing it for a few weeks with my renovation! Just remember how much you will love it when it's all done! Thanks, Shelley!! I am hanging in there! It helps that the kids aren't in school right now and we aren't on a tight schedule. Of course, school starts in a couple of weeks, so I may start losing my mind then!! Would you believe the thing that is driving me most crazy right now is finding a faucet?? Why are all the ones I like so expensive?? Hope you are enjoying your new space. It is gorgeous!!! Its looking good..its going to be fun to see the transformation. I need to renovate my kitchen. Right now the counter tops are the old laminate wood stuff. I want to put in something more sturdy like granite or another surface. Is there a less expensive version of granite out there?